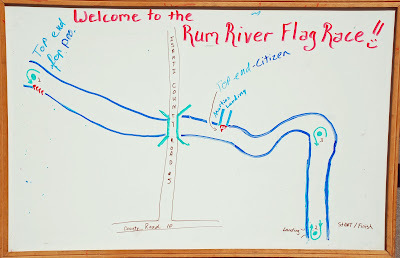 A couple days ago I made arrangements with Julie who works at Country Camping Tent and RV Park to use their landing on the Rum River near Isanti, Minnesota. Ed Arenz and I wanted to paddle the race course before Sunday’s race. Keith Canny and Lee Jarpy decided to join us. The last two times paddling with Joe Conrad and Ed Arenz I couldn’t trim my We-no-nah V1 Pro canoe properly. The more I thought about it I also had two fairly heavy dry bags in the canoe during these paddles that actually were helping me trim the canoe and I still was bow down. There was no way I would be any better for this Sunday’s upcoming race when I didn’t have the dry bags in the canoe. What was I going to do? Well, I decided to break out my Crozier V1 Pro. Everett Crozier made this canoe for me in the winter of 2001.That winter I set it up for racing, but since I had another V1 Pro this canoe would only be used in one race. 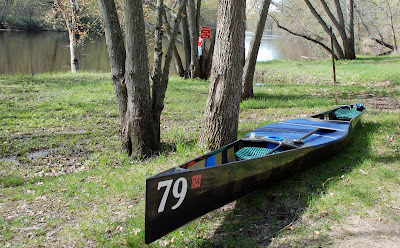 Kate Ellis and I raced in this canoe in the final race of 2003 on Lake Bemidji at the Headwaters Classic Canoe Race. In that race I was in the bow and Kate paddled the stern. Last night I put the Crozier V1 Pro on the Suburban so I wouldn’t have to do in the morning. It was around 50 degrees when I woke up around 0600 am. The winds were expected to increase throughout the morning. We were to meet around 1000 am at Country Camping’s office building. When I started out for the 28 mile drive there was blue skies and the temperature was rising. Today was one of the few days this spring that actually felt like a spring day. I was looking forward to today’s paddle. There were some thin, white clouds that began to move in, but they would eventually completely clear out. The front door to Country Camping was open when I pulled in at 0910 am. I was early, but that’s not unusual. Julie was inside the office where I introduced myself. 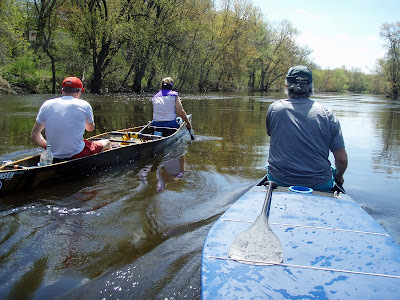 We talked about the previous year’s races and other canoeing trips. Julie also showed me a layout of this years race that Pati Midlo drew for the racers. Keith Canny was the next person to show up. Keith and I spent some time talking at the picnic table while basking in the sun before Lee Jarpy pulled in and then Ed Arenz pulled in right at 1000 am. We all drove down to the landing where we parked our vehicles. Ed walked to the stern of the C-2 and I could see the look in Ed’s face like, where did this canoe come from. We took the canoe out of the cover and placed the canoe on the grass. It has been 4 ½ years since this canoe has seen any sun and I couldn’t remember if I changed the foot brace position since Kate was in the stern last. It was in the correct position so I must have changed it. After I took the cover off I realized I forgot to bring my current license from home to put on the canoe. Earlier this winter/spring I had to buy either 4 or 5 licenses for my canoes. Ed made the comment that he didn’t see any scuff marks on the inside bottom of the canoe. I told him there was a reason he didn’t see any marks. I told him that he has to remove his shoes if he wanted to paddle in it. I took a couple photos of my old, new looking Crozier C-2 while it was out of the water. Next I told Ed that I couldn’t have any river water touching the outside of the canoe either. Since both of these demands seemed unreasonable I eventually gave in and off we went. We put in the water at 1023 am. It was just a fantastic morning to get out on the water for a paddle and it just felt good. Immediately I took off my shirt to soak up the sunshine. Earlier at home I put on sun screen. I noticed the difference in the feel in the Crozier over the We-no-nah right away. 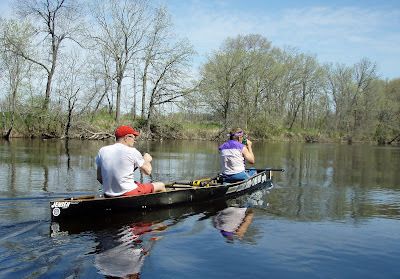 The Crozier is a much better quality boat and it is much more responsive over the We-no-nah because it’s much stiffer. Ed told me he could tell the difference immediately, also. It’s going to be tough when I paddle the We-no-nah again. I think I’ll only use it now for training or racing in really shallow, rocky rivers. Of course, Keith started in the psychological mind games saying things like, for a Crozier canoe it sure is throwing off such a large wake and the canoe looks nice, but it sure is floating deep in the water. All in the attempt to make us believe we were paddling slow. The last time I paddled this portion of the river was in the 2003 race. Ed and I would paddle hard, go back and ride the other boat and talk about current canoe events. 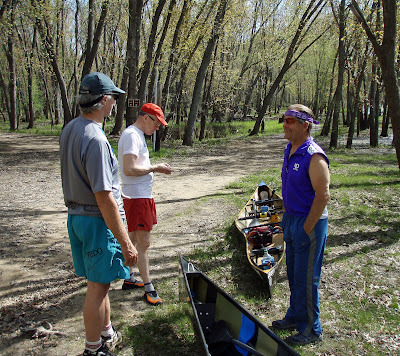 One thing you must know when paddling with Keith and Lee is that they will tell you many different “stories”. I’ve mentioned about the notorious bridge sprints. What I didn’t know was that in Keith and Lee’s mind they have never lost a sprint even though they have never always crossed the imaginary line first. A couple days ago it was the age adjusted handicap and today there were other reasons why they won. 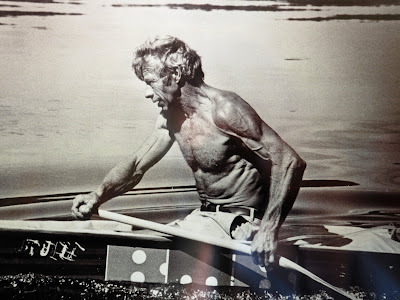 One thing you can be guaranteed is in a smaller group you get the time to listen to Keith talk about his past experiences paddling with the “Legends’ of canoe racing, Gene Jensen and Buzzy Peterson. We continued up past Martins Landing where the recreational canoes will turn around and head back to the finish. We continued on past the first Bridge where I think Ed and I crossed the line first, but if you ask Keith and Lee they won it. I forgot the reason, but the other two guys will tell you. If you ask them separately you’ll get two answers for sure. We all kept looking for the area where the flags will be stuck in the river bank for Sunday’s race. Everyone kept saying I think it’s just up a head. This went on and on for some time around every bend. This went on until we reached the bridge in Cambridge about two hours later. Finally someone said I think we must have missed it. Someone else said they still thought it was still up ahead beyond the bridge. We circled the Bridge and then decided to pull over and have a snack at the park just downstream of the Bridge. There were a few people enjoying the day in the park. One guy even mentioned something about our “kayaks”. We took an extended 23 minute break at the park. Although today it seemed shorter since today was just so nice being outdoors. I was lucky I had a Power bar and a Protein bar in my small dry bag. I forgot to bring my bananas. It wasn’t until after I ate them that I found out that Ed didn’t have anything. He said he didn’t figure we were going to be gone so long. Lee came to his rescue and had some extra energy bars. Back on the water at 1250 pm we paddled downstream. There were several times on the way back Ed and I would do a strong pull and get well ahead of the other canoe. One time Lee yelled out and said to us that they still had our wave even though they were 30 yards back. More of that psychological mind games stuff. The good natured banter was constant on the river today. 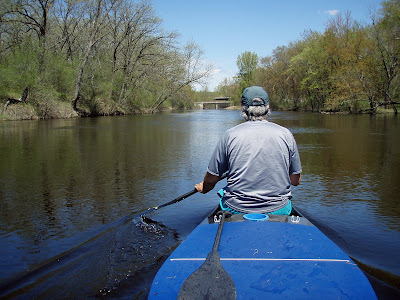 The paddle downstream lasted 1 hour and twenty –five minutes making today’s total paddle time of three hours and twenty-nine minutes. 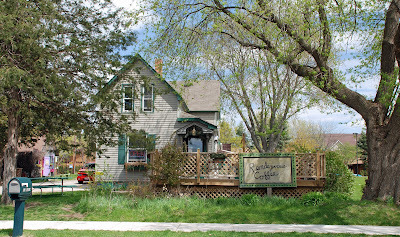 Back at the landing Ed suggested we go to the Rendezvous Coffee in Isanti. Warren Thunstrom is a friend and fellow racer who owns the quaint coffee shop. Back in 1999 when I started racing, I paddled on either a Saturday or Sunday and the first person I paddled with was Keith Canny. Warren was in his C-1 that day and on my first outing with the group Warren asked me to do a Hoigaard’s race with him that next Thursday. Warren and I did several races together in 1999. I actually have never been in the coffee shop before, but the other three have. I was shown a couple framed pictures of Buzzy Peterson handing on the walls. I brought my camera and tripod inside and took some pictures of the two pictures of Buzzy. 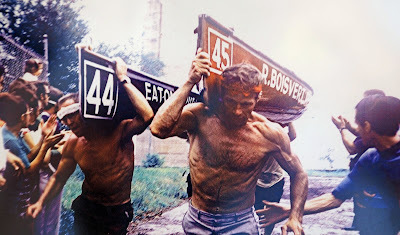 I have previously mentioned some of Buzzy’s wins in the article I wrote, What is Marathon Canoe Racing?, that is posted on this blog. Walking out of the coffee shop I got a little excited about an upcoming event, but then I read the rest of the banner.